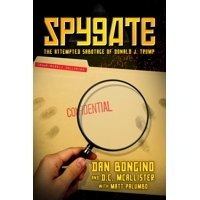 Spygate: The Attempted Sabotage of Donald J. Trump by Dan Bongino. Former Secret Service agent and NYPD police officer Dan Bongino joins forces with journalist D.C. McAllister to clear away fake news and show you how Trump’s political opponents, both foreign and domestic, tried to sabotage his campaign and delegitimize his presidency. Of course, everyone has an opinion about whether or not Donald Trump colluded with the Russians to defeat Hillary Clinton in 2016. The number of actors involved is staggering, the events are complicated, and it’s hard to know who or what to believe. Spygate bypasses opinion and brings facts together to expose the greatest political scandal in American history. CLICK HERE FOR SOURCE: http://boomerspeaks.com/273893/285793.html .